There are few routine household maintenance chores that pay off more than keeping a maintenance schedule for your air conditioning unit. Not only will you give yourself the best chance at staying cool all summer and avoiding emergency breakdowns, but you’ll also save money on your energy bills says Worlock Heat and Air Conditioning. 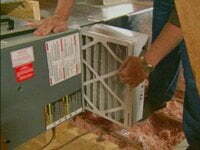 A well maintained AC unit will run more efficiently, use less energy, and cost less money to run. A properly maintained system will also last longer before needing to be replaced. It should be noted that there are some tasks that can be done by the average homeowner, but others should not be performed by anyone who doesn’t have the proper training and a license. If at any time you are uncomfortable with performing maintenance tasks yourself, never hesitate to call on a professional to do it for you. Always observe safety precautions; and before you perform any work on your outdoor unit, ALWAYS shut down the power to the unit at your electrical box first. Replacing your air conditioner air filter (or cleaning it, if you have a reusable filter) is one of the most important regular AC maintenance chores. It should be done every month during high-use seasons (like summer and winter) and once during the fall and spring. Behind the return air grille on a wall or ceiling in a central room of the house. Inside the blower compartment of the air handler or furnace. In a slot on the side, bottom, or top of your furnace. When the filter becomes full of dust, dirt and allergen particles, the air flow will decrease, making your system work harder than it should have to. The air flowing through your system may also become dirtier, dustier, and prone to triggering allergy and asthma symptoms for those residing in the home. Before working on an air conditioner, Power Electricians AZ recommends ALWAYS start by turning off the power to the unit, which can be done at the service disconnect on your outdoor unit or at the main breaker panel of your home. Next, remove the access panel on your condensing unit and see if you see any signs of overheating – melted insulation on wires, blackened or burned-looking wires, and the like. You can also check any electrical connections to make sure they are tight. If you own an electrical test meter, you can check the capacitors in the unit. 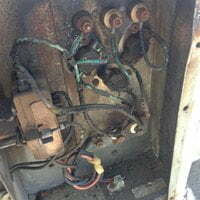 Take a look at the contactor switch, and replace it if you see excessive pitting. If you see any of the above problems and do not feel comfortable replacing the parts yourself, always call a local heating and air conditioning expert to do the work for you. A programmable thermostat allows you to set the temperature higher when no one is home (do not turn the AC off, just up), and cool the house down about 30 minutes before people arrive home for the evening. That way you’ll always have a comfortable home waiting for you, and you’ll save energy and money by not having your AC running all day when no one is at home. 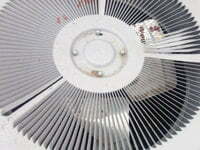 If you have an older air conditioner unit, the fan motor bearings may need to be oiled regularly as well. Over time leaves, dirt, grass clippings and the like will build up on the outside of the air conditioner unit, decreasing system capacity and reducing air flow. After shutting off the power to the unit, use a garden hose to gently wash out the debris, starting at the top with the hose at about a 45° angle. Do NOT use a power washer, and take care not to bend or damage the delicate fins on the coil. You should also trim any shrubs or other plants back from around your air conditioner to keep from impeding air flow to and from the unit. Properly maintaining your air conditioning unit will be of great benefit in terms of saving money, saving energy, and keeping you comfortable during the hottest days of the summer. Your local heating and air conditioning service companies, like Worlock Heating and Air, will always be more than happy to help you with any and all of your air conditioning needs. 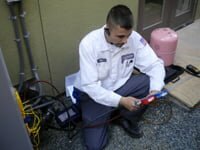 They can also check your air conditioner and perform additional maintenance tasks on an annual basis that will ensure your AC unit performs as efficiently as possible for as many years as possible.